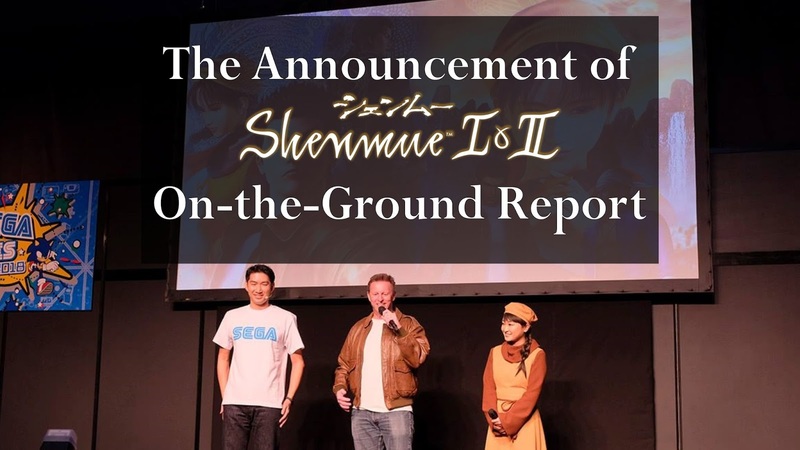 Sega's announcement last weekend that Shenmue I & II would be coming to modern platforms set the Shenmue community on fire. Interestingly, they chose to make the announcement at their SEGA FES 2018 event in Japan. While some fans around the world watched it on live-stream, many caught the news the next morning when they awoke. I was lucky enough to attend the presentation in Tokyo. I recount my experience below. 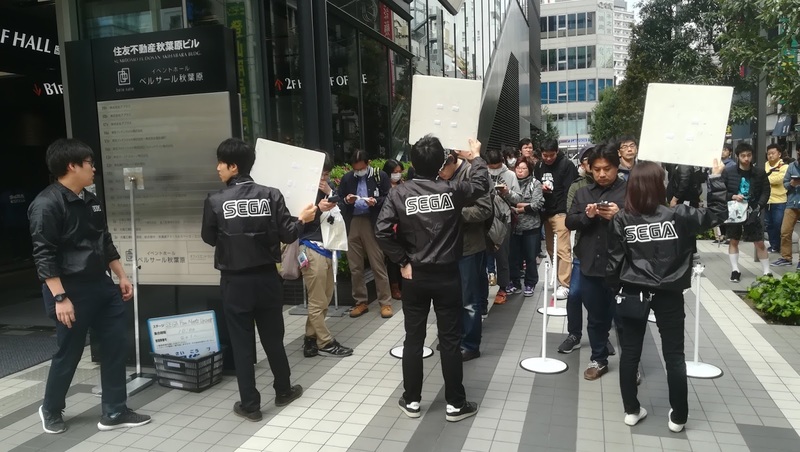 Scheduled in mid-April was Sega's two-day SEGA FES event to be held on the weekend of April 14th & 15th in Akihabara, an area of Tokyo famous around the world for being a center of Japanese otaku culture and a shopping district for electronics, anime, manga and video games. It promised to provide a mixture of stage events, entertainment, product information and playable old classic arcade cabinets such as Virtua Fighter 2. While the event itself contained an attractive mix of content, my expectations for anything Shenmue related at the event were not set very high. 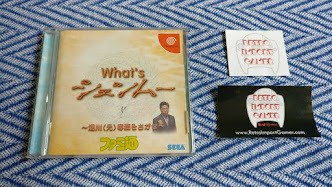 Sure, there was a note of potential "surprise announcements" in the schedule, and there would be the chance to try one's luck to obtain a Ryo Hazuki badge at the capsule toy machines, but a scan of the merchandise list showed that it did not even contain the Shenmue-themed T-shirt that Sega had offered at previous events like the Tokyo Game Show. The first real inkling that something was afoot came in the form of a tweet from Sega Europe made late Friday evening (Japan time). It stated that there would be a "HUGE announcement" made in the morning that "you DO NOT want to miss". Rumors started flying on the internet about what this might be - and then soon after it was retweeted by Koch Media. At this point it being apparent that something big might be about to happen for Shenmue. "Could this be the Shenmue HD announcement the fans have been waiting for all this time? As always, it may be something quite different so keeping a level head is advised to avoid disappointment - but we will have our answer very soon!" A few short hours later the next morning, things then got very specific with Sega Europe urging everyone to tune in to the livestream at a time that corresponded to the 10:30 am "SEGA Fan Meet-Up" session at which the CEO of SEGA, Haruki Satomi, would open the event before an audience of fans. There was still no direct information as to exactly what would be revealed however. With little expectation of being able to actually enter the Meet-Up session itself (the schedule showed it to be booked out), I set out to the train station for the one-hour journey into Tokyo, pausing only to tweet out a quick photo on the way. On arriving at Akihabara, I navigated my way to the venue which was an event hall in a modern-looking building called Belle Salle. The massive SEGA sign outside removed any doubt that I had the right place. To one side of the building were several lines of people, all holding their reserved numbered ticket for the morning session. Just in case, I asked one of the Sega staff whether there were any additional tickets available, but alas, the answer was negative. ...in a small basement-level lobby, containing several Sega staff scattered about, one of which was checking the numbered tickets of the last few fans before ushering them though an open door beyond which I could sense flickering lights and hear muffled music. Seizing the opportunity, I asked a nearby staff member whether there was the possibility of any spare places for the session. After a short exchange with the person in charge, he nodded and waved me across! I was handed a white commemorative T-shirt, and a moment later the music intensified as I stepped cautiously through the indicated doorway and into the presentation room. The first thing that hit me was the warm mugginess of the room. 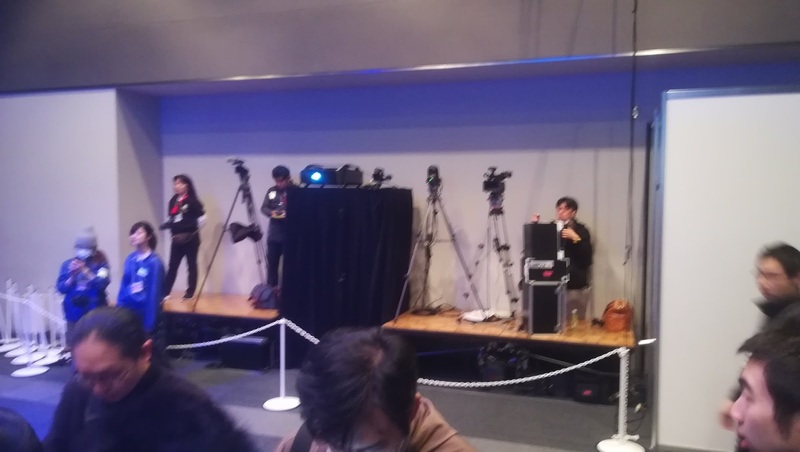 The room was dimly-lit and three-quarters full of fans (90% male, I would guess) standing in neat rows, with the main source of light being from a large projection screen at the front showing Sega game advertisements above a spot-lit stage. As I walked across to my place, I glanced at the cameras lined up at the back of the room. At the front, several rows were taken up by seating for the invited media representatives. Cameras lined the back of the room. On reaching zero, the CEO of Sega Japan himself, Haruki Satomi, strode onto the stage to welcome the fans to the event, and the presentation was underway. Once his introductory chat was over, I held my breath in anticipation for that one particular topic. Satomi explained that there were going to be four special announcements. My pulse was racing at the first one, which he prefaced as being something for which Sega had listened to the voice of the fans, "especially overseas". However this turned out to be merely the release of Sega Ages for the Nintendo Switch. The next announcement was the Sega Mega Drive Mini. The tension only built higher and I was finding it hard to concentrate on these other topics. Satomi then started to talk about a poll that had been run two years ago at the previous SEGA FES in 2016 of the Most Wished-For Revival: votes had been taken online over the course of a few days, from Sega fans throughout the world. I grabbed my phone and started filming right away as a countdown of the top 10 game titles began, starting with "NiGHTS into dreams". And then the countdown stopped when it reached Number 4: Shenmue. This was it! The moment Shenmue fans had been waiting for turned to reality as the screen faded to black and the broken sign of the Hazuki Dojo faded into view. As the trailer played announcing the ports of Shenmue I & II, I fought an impulse to shout out in excitement (being in Japan it's not really the thing to do), but inside I was beyond exhilarated. After the trailer, I joined the rest of the crowd in heartfelt applause. And then Executive Vice President of Publishing for Sega Europe, John Clark, came onto the stage dressed as Ryo Hazuki, accompanied by a translator dressed in a Shenhua costume (which I thought that was a nice touch, and apparently one that John had organized - it reminded me of the media events the Japanese voice actors held in costume for the release of the original games). Executive Vice President of Publishing for Sega Europe, John Clark on stage. There was a short exchange of questions and answers (clearly scripted, but communicating the message effectively), and just a few short minutes later the announcement was over. Enjoyed the article? Support the blog! 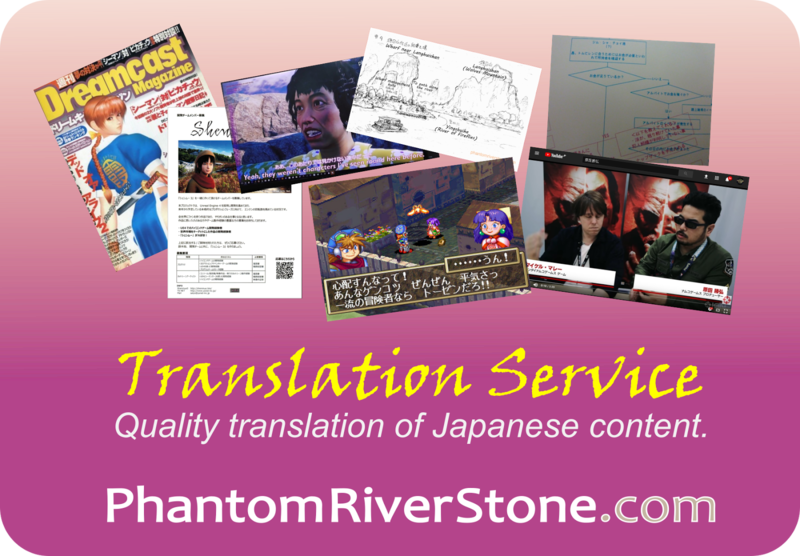 Check out our Patreon page with great rewards offered to Phantom River Stone patrons. 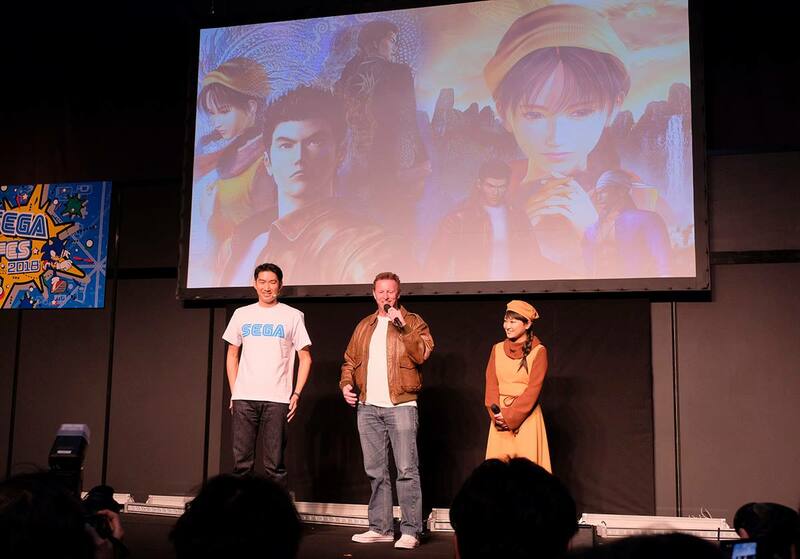 What a great day it was for Shenmue fans around the globe!! Thanks for putting together your experience of the day, it gave me a chance to be part of it vicariously; living in England I only saw the news early Saturday morning! Loved the way your account was put together; not just the event but a little of your day building up to the announcement. Another great post on PhantomRiverstone.com! Thank you DreamcastPast!! I wrote this post precisely for fans like yourself who wished they could have been there too, and I'm happy to have been able to share a bit of the excitement and atmosphere. P.S. No pun intended. Lol. 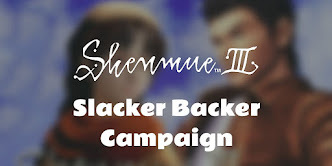 ;-) It's so great to see the joy that this announcement has given to fans, and to think of the opportunity it will provide for players who don't yet know the series to give it a try (and, hopefully, fall in love with it in time for Shenmue III!). :D It was a day to remember! I have an old Poster of Sakura Wars on my wall hanging (over my bed ;-) ). That must have been an exciting day when you were on the ground. Was a ticket for this Event expensive? Oh, are you a fan of the Sakura Wars games? I haven't played them myself. 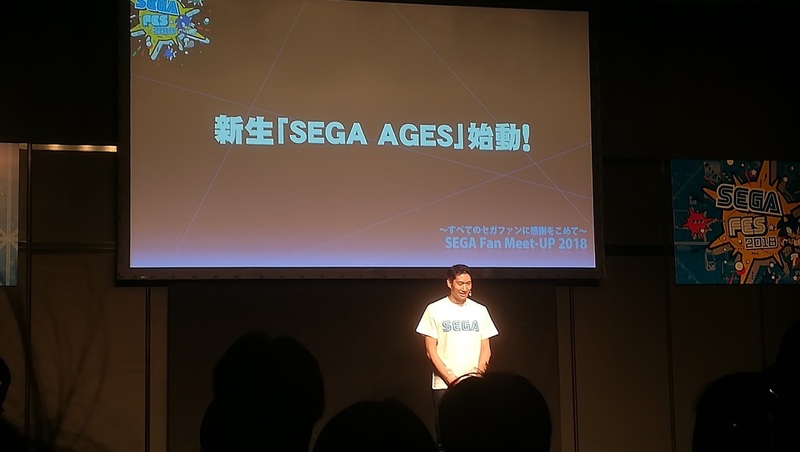 All the events at SEGA Fes were free - the problem was that for popular sessions like the opening announcement the number of places was limited and were filled by fans weeks in advance. I was extremely lucky to get in! It was a really exciting experience. I have here a Link with the Posters. No, i know just this Posters. The Anime or the Games never played or seen. A big Event for free? This is awesome! Unbelievable to my country. When i imagine the gamescom would be for free... :-) Great.